The Atlantic whitefish is a coregonid species, which is classified as a subfamily within the salmonids. Its physical resemblance to the more common lake whitefish originally delayed its identification (COSEWIC 2010). Although, previously known as the Acadian whitefish, Sault whitefish, round whitefish, and common whitefish (Edge and Gilhen 2001), anatomical comparisons and genetic analyses have confirmed the Atlantic whitefish as a separate and distinct species (Bernatchez et al. 1991; Murray 2005; COSEWIC 2010). 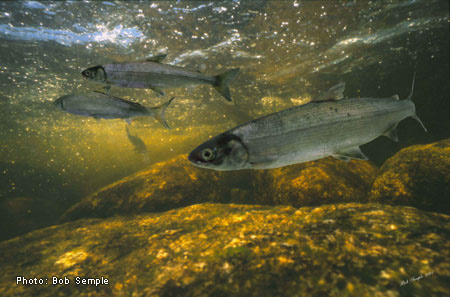 The Atlantic whitefish has silver sides, a white belly, and a black, dark blue, or dark green back (Figure 1). It can be further identified by its deeply forked tail and the presence of a fleshy adipose fin, which lies along its back, between its dorsal and caudal fin (Scott and Scott 1988). Land-locked individuals reach an average length of 20 to 25 cm, significantly smaller than anadromous individuals, which average 38 cm in length but can reach up to 50 cm (Bradford 2000). Anatomical comparisons conducted by Hasselman et al. (2009), showed that three species-specific characteristics consistently distinguished the Atlantic whitefish from the lake whitefish. The Atlantic whitefish was found to have shorter pectoral fin lengths, a greater number of lateral line scales (Atlantic whitefish: mean = 94; lake whitefish: mean = 77), and a more terminal mouth position. Although the remaining Atlantic whitefish population is now only found within the Petite Rivière watershed, historically, an anadromous population was also known to exist in the Tusket-Annis watersheds in Yarmouth County, Nova Scotia. However, since there have been no reported Atlantic whitefish sightings in the Tusket or Annis rivers since 1982, this population is believed to be extirpated (Bradford et al. 2010). Occasional, isolated sightings have been reported in other coastal areas, including the Sissiboo River (in 1909) (Scott and Scott 1988), Halls Harbour (in 1958) (Edge and Gilhen 2001), the Lahave Estuary (in 1995 and 1997) (Edge and Gilhen 2001), the Medway River (DFO 2011 Pers. Comm. ), and the lower reaches of the Petite Rivière system, including Fancy Lake (DFO 2006). Although it is possible that the species’ range had already been reduced prior to its identification in 1922 (Huntsman 1922; DFO 2004a), these individuals were likely remnant members of either the Petite or Tusket-Annis River populations (DFO 2006). YouTube video of Atlantic White fish captured by Andrew Breen in 2014. In 2015 there were no Atlantic whitefish to be found. The Atlantic whitefish (Coregonus huntsmani) is a naturally anadromous, endangered fish species, which is endemic to eastern Canada. Currently, it is only found within the Petite Rivière watershed in Lunenburg County, Nova Scotia. In 1984, the Atlantic whitefish became the first Canadian fish species to be classified as “endangered” by the Committee on the Status of Endangered Wildlife in Canada (COSEWIC). Its “endangered” status was reconfirmed by COSEWIC in 2000, and more recently in 2010. The Atlantic whitefish was also recognized as being threatened with imminent extinction and is listed as “endangered” on Schedule 1 of the federal Species at Risk Act (SARA) in 2003. It is protected under the Maritime Fishery Regulations, the federal Species at Risk Act, and the Nova Scotia Endangered Species Act. Extinction of the Atlantic whitefish would have a significant effect on the local aquatic biodiversity (COSEWIC 2010). Therefore, with an aim to help conserve and recover the current population, Bluenose Coastal Action has been dedicated to raising public awareness and researching the Atlantic whitefish since 2004. Source: The above information is taken from the Bluenose Costal Action Foundation website. Write to the new Fisheries Minister, Hunter Tootoo, urging him to exert pressure on DFO Maritimes to start a captive breeding program and implement range expansion of the species. Extinction is very likely if they are left to fend for themselves in the Petite Riviere watershed. In 2013, Chain pickerel were discovered in Hebb and Milipsigate Lakes, and now only 3 years later they can be found throughout the system. Chain pickerel is an invasive fish and, along with Smallmouth bass, are predatory fish that will eat Atlantic whitefish and other fish. Official Recovery Potential Assessment for the Atlantic whitefish written in 2009.